I’ll be honest, salad isn’t always my thing… I’m more of a chocolate cake kind of girl. Heehee. But if I’m going to eat a salad, it’s got to be really delicious. Since I’ve got a sweet tooth, I love incorporating fruits into my salads. I love this time of year because of all the fresh produce that’s available. Strawberry picking is a family favorite every June, and I love coming up with ways to incorporate the strawberries into fun new recipes. 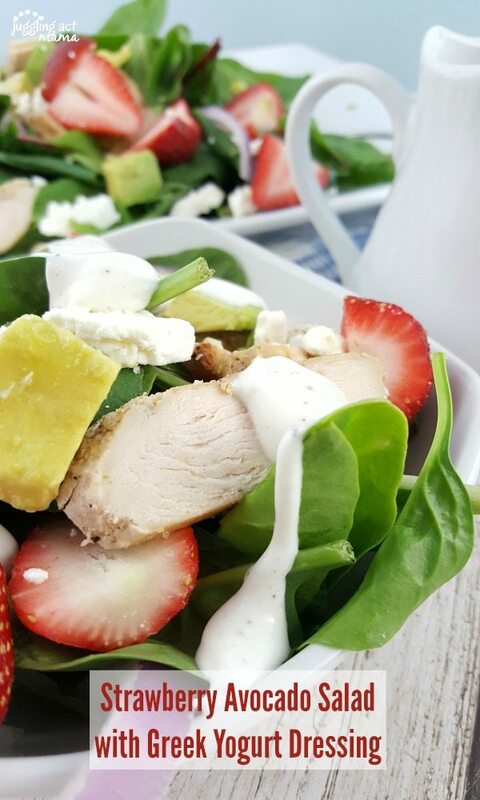 This salad is loaded with sweet strawberries, creamy avocado, grilled chicken, tangy feta and loads of delicious mixed greens from Taylor Farms. Our dressing is made with garlic and lemon, paired with Greek yogurt. 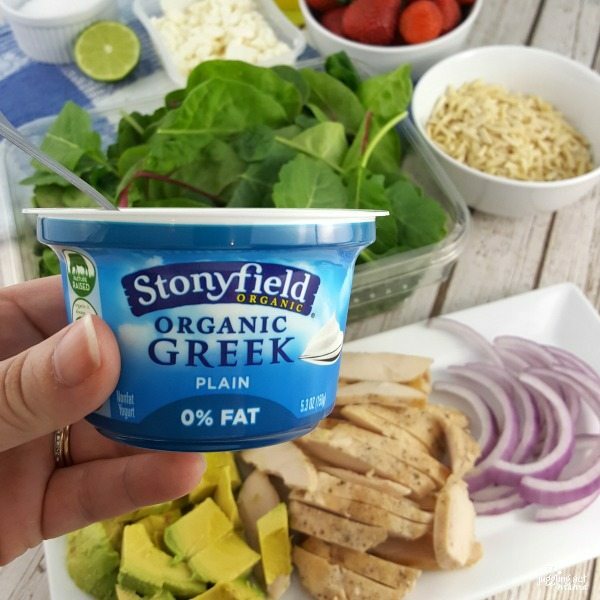 Stonyfield Greek yogurt is my favorite choice because I know it’s a quality product. I love making my own dressings, it’s super easy to do and really makes a salad something special! My Avocado Ranch Dressing has been popular with readers for quite awhile now! In a small bowl, mix together the Stonyfield Greek Yogurt, milk, feta cheese, lemon juice and a clove of minced garlic. Whisk the dressing to combine and refrigerate. Season the chicken breasts with salt and pepper cook in a skillet with olive oil. Set aside. Wash the salad greens and spin dry. Cut the avocado lengthwise, remove the pit and use an avocado slicer to remove the slices. Toss with lime juice. Slice the chicken and red onion into thin strips. 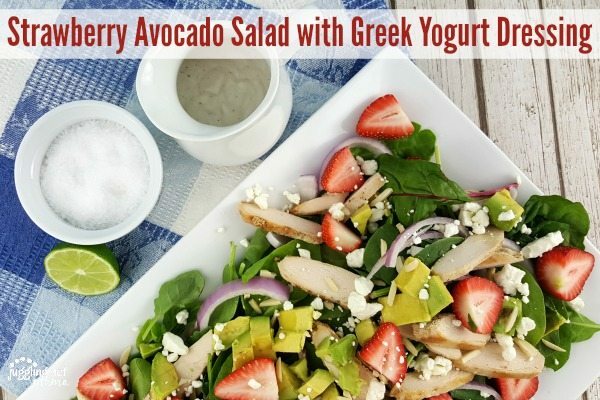 To assemble the salad, arrange the greens on a platter, than top with the strawberries, chicken, avocado, red onion, feta and slivered almonds. Serve with Greek Yogurt Dressing on the side. Adding grilled chicken makes the Spinach and Strawberry Salad perfect for mealtime. This salad also makes a great side dish for buffets and potlock dinners. 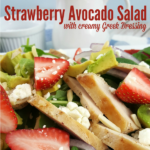 Grilled chicken, fresh avocado and crumbled feta cheese on this spinach and strawberry salad make it worthy of a whole meal, not just a side dish! Squeeze the lime juice over the avocado and toss to coat. On a large platter or in a large bowl, arrange the greens. Top with the strawberries, grilled chicken, red onion, crumbled feta and slivered almonds. Whisk the ingredients together until well combined and smooth. For best flavor make ahead and let the flavors all marry in the refrigerator. This looks so healthy and delicious! My family and I have been working toward changing our eating habits and sometimes I run out of ideas. This is a recipe I will be trying for them, hopefully, this week! Thanks so much for sharing. We plan to go strawberry picking this week and now we have an awesome recipe to use! We are also huge Stonyfield fans so this is a no brainer! Thanks JugglingAct Mama! I love making my own dressings, and this sounds delicious! We LOVE Greek yogurt! This salad is really tasty and my boyfriend really liked it, too.